This will be the first installment of OOPS, aka Outside Oslo Project Status. Thanks to the fabulous Marmalade Fabrics, I have one yard each of Jessica Jones' (aka How About Orange) equally fabulous new line of fabric, Outside Oslo. I love everything about this line: the clean graphics, the colors, the nice weight of home dec fabric. 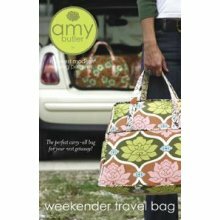 The first sewing project will be Amy Butler's Weekender Travel Bag. One of my best friends has been working on this project all week so I've gotten lots of valuable advice from her. Have any of you made it? I'll take any hints I can get. I'm so excited that my father has a heavy-duty sewing machine from his former days as a reupholsterer, so I'll be taking advantage of his piping foot and might actually sew the whole thing on his machine. And here's a sneak peek at another OOPS project I'll be working on. I'll tantalize you with the "before" version for now. "I love your little name game/selvage pincushion and I am very excited for the upcoming series on bloggers names-- great idea!" Thanks for playing along, Elisa.It will be on its way to you shortly. I just finished a Weekender bag on Monday! It really wasn't hard at all. One change I made was to make the piping using Heat n' Bond 6mm fusible tape rather than sewing it. I also joined the ends of the piping rather than overlapping them like she does in the pattern (using the instructions from a book called "The Bag Making Bible.") Finally, I added an interior pocket made in the exact same way as the front and back pockets on the outside but without the interfacing. I attached it to the lining main panel and then sewed a line down the middle of the pocket to split it into two smaller pockets. A bag that huge definitely needs inside pockets! Next time I'm going to add a zippered pocket to the inside as well. I've got the weekender bag sitting near my sewing table waiting for me to cut it out! can't wait to hear how it goes for you. I've made two of the weekender bags. First, it really helps if you baste the piping to the outside first, and then pin the sides on. It keeps it from moving on you when you can't see it very well. Also, re-inforce your straps more than it says to in the pattern. I would top stitch them all the way to the bottom of the bag. I've broken the straps on mine many times. Those are some wonderful fabrics!!!! You have your work cut out for you on that big project and I love the Weekender bag. I do love the graphic designs of Jessica's prints! Very modern and fun. Great idea to make a weekend bag with them. You are ambitious to recover that ottoman. Always wanted to try that so I'm looking forward to hearing more about your progress. Your bag is going to look fabulous with those fabrics! I can't wait to see it in progress. Maybe this will push me ... oooh good luck ... I'll keep watching ...! OMG-- I am so excited that I won the Name Game selvage pincushion!! ! I just love it!! Thank you, thank you!! Lucky me :0) And you have yet another great series/theme with your OOPS projects. I look forward to reading about those as well. I have never worked with home decor/outdoor fabric, so I will be curious to see how it goes. Thanks again for your giveaway! Cindy, these are to fabulously exciting projects. 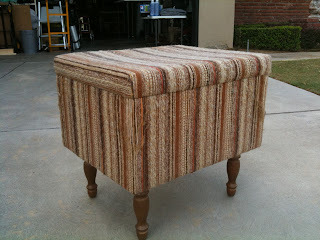 That ottoman is gonna be killer in the new fabric!!!! Good luck with the weekender bag. I am buoyed by the comments of the two that said it wasn't that hard. Good luck and enjoy that gorgeous fabric. I ordered some the day you first posted about it and plan to make Anna's 241 bag with it. I have the pattern for the weekender bag but havent made it yet. I did however make the Amy Butler sweet harmony purse and while cutting/fusing all the pieces and parts was quite a project it came out really well. In fact I used the purse so much I wore the corners of the purse out, and just recently made another. The one thing I found with the sweet harmony purse was that the lining was just too big to fit well inside, pattern says to just sew 5/8" seams instead of 1/2" seams, but that wasn't enough I ended up ctting 1/4" off around the edge of the lining pieces. ANyway, I don't know how the weekender lining is done but you might want to keep in mind about the size of the lining. I also just recovered a footstool and it was really easy - helps to have an electric stapler though! Love your fabric and I can't wait to see how your bag turns out, maybe it will get me motivated to make one too. I find it interesting how the views on making the Weekender bag can vary so much. I wonder why that is. Other than possibly skill level, perhaps it's the standards of the sewers?